The villa Panorama Atlantico is in the peaceful holiday complex Monte da Galé in Praia da Galé on the Algarve in Portugal. The villa with 130 m2 living space has 4 bedrooms (on two floors), 4 bathrooms (some with shower/bath), living room (with SAT-TV and stereo system) and a fully equipped kitchen. The spacious garden with pool and outdoor grill invites you to be lazy and relax. The sea and the beach with one of the most beautiful coasts in Europe can be reached in a few minutes on foot. You can choose between long beach walks or walks along the typical bizarre cliff formations of the Algarve. The holiday complex Monte da Galé with its villas and two-story apartment houses is surrounded by Mediterranean plants. The complex has a reception desk, a tower restaurant and a supermarket with coffee. The city of Praia da Galé with a lot of shopping facilities and restaurants can be reached on foot in a 5 minute walk. Sport & recreation: Sport options nearby include fishing, horse riding, surfing, sailing and diving. Furthermore, you can also go on boating tours, deep sea fishing or safaris in the mountains. Moreover, one of the most beautiful golf courses in the Algarve - the course 'Salgados Golf' is nearby. The climate on the Algarve: The sea and the structure of the landscape form Portugal's Mediterranean climate. The summers are steady, dry and hot - but still very comfortable through a constant light Atlantic wind. Thanks to the balanced climate, you can go swimming from May to the beginning of November. The beach of Praia da Galé: The long beach of Praia da Galé is divided into multiple sections. To the east it is bordered by cliffs. To the west the beach is wider and about 2 km long. You can walk to Amacao de Pera. The closest Galé beach to the east is Manuel Lourenco. The relatively small bay is surrounded by 15 m high cliffs. The sand is very fine and clean - a small paradise. Quiet but enough going on around the area. 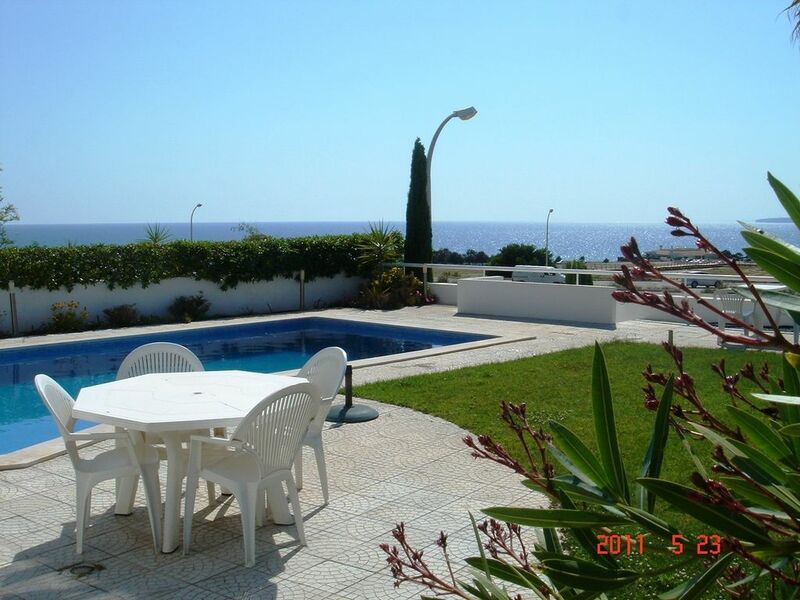 Great villa, Great beach, sleeps 8 with plenty of room. Pool was nice to dip in when hot. nice guest with 3 children. We rented this house for 32 days and loved every minute of it. Beautiful views of the ocean from the livingroom and yard. The house is very roomy with all amenities required for long term stay. We were a 10 minute walk to the grocery store and 5 minutes to the bus stop. I highly recommend! I can not praise the villa or the area enough. The villa and pool area were in excellent condition. There were 8 adults and our grand-daughter and we still had plenty of space. We were 5 minutes walk from the beautiful blue flag beach and relaxing at the pool watching the sunset really was spectacular. The beachside restaurants had something for everyone, including hard to please teenagers! This area is a hidden gem and the location of the villa was perfect. Although we loved the chilled vibe in Gale it was close enough to Albufeira for our teenagers to go shopping and our older boys and their friends to have s few lively nights out. Thank you to Otto and his wife for the most perfect holiday. De villa is zeer ruim en van alle gemakken voorzien. Met 4 slaapkamers en 4 badkamers ideaal voor een verblijf met de familie. De villa kwam goed overeen met de foto's en beschrijving op het internet. De villa was bij aankomst zeer schoon en is goed geoutilleerd. Iedere week wordt de villa schoongemaakt en het bedlinnen en de handdoeken vervangen. Het is een ideale basis om de mooie kust in de omgeving te verkennen. In de winter moet rekening gehouden worden met extra kosten voor de elektrische verwarming. exelente Lage mit tollem Meerblick. Ein Sonnenuntergang im Atlantik mit einem Port von der Terrasse in alle Ruhe genießen. Strand 3 Minuten zu Fuß. Villa sehr gut und geschmackvoll ausgestattet. Ideal für meinen Hund. Konnten direkt vor dem Haus zum Strand spazieren. Nah zum Strand und trotzdem ruhig und alleine. Sehr gute Infrastruktur mit Restaurants und Cafe´s fußläufig. The holiday complex Monte da Galé in Praia da Galé is 6 km west of Albufeira. From the Faro airport you can reach the city in about 40 min. Praia da Gale consists primarily of villas, small resorts and a few hotels and have a lot of shopping facilities and restaurants of all price classes. Golf: One of the most beautiful golf courses in the Algarve - the course 'Salgados Golf' is nearby. Im Preis eingeschlossen sind: Bettwaesche, Hand- und Geschirrtuecher, Foehn (in jedem Bad), Strom und Wasser, woechentliche Reinigung mit Waeschewechsel , sowie Endreinigung . Es sind bis zu zwei Hunde erlaubt .Gerne koennen Sie bei uns kostenlos Decken und Naepfe ausleihen. Pro Hund kommt eine Pauschale von € 25.- pro Aufenthalt dazu Wintervermietung sind 40cbm Wasser , sowie 500 kW /Std Strom per Monat im Preis enthalten .Jeder weitere Verbrauch wird mit € 3,50 pro qm Wasser und € 0,20 per KW Std. berechnet . Die Endreinigung ist im Mietpreis enthalten . In der Wintervermietung ist keine Zwischenreinigung im Mietpreis enthalten .